In my former parish I mounted the Greek Orthodox icon of Christ the Good Shepherd in the Narthex. In Greek the name is O Poimen, O Kalos. At the parish at St. Joseph’s Villa Chapel, Richmond, Va, we had a stained glass window depicting Christ the Good Shepherd surrounded by lambs, with a lamb over His shoulder. At right is the central detail of the window. This and other stained glass windows at the Chapel are pictured in the AIC Bookstore publication, Paintings on Light: the Stained Glass Windows of St. Joseph’s Villa Chapel, which is available from my Author Central page at Amazon: https://www.Amazon.com/Author/Ronald-E-Shibley. 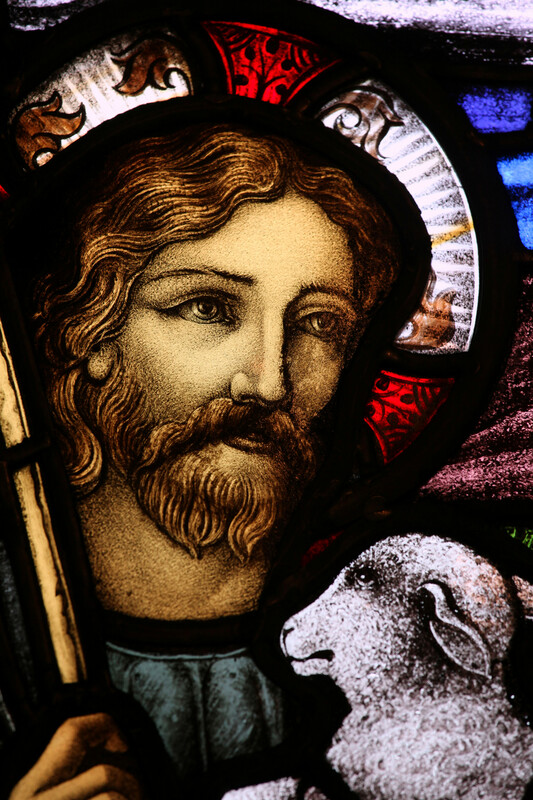 In the research for the Bible Study series, I found a very fine 19th Century stained glass depiction of Jesus, which is mounted at an Anglican Church in Nova Scotia, Canada. The original church was built in 1749. The vendor did not identify the artist. The Bible Study series continues with, as noted, the uploading of Episode 42, which continues my discussion of the Gospel of St. John with John’s unique treatment of Peter, Judas, Nicodemus and Mary Madgalene. I’m wrapping up the final two episodes on St. John and will then turn to completing the You Tube video version of my verse-by-verse discussion of Revelation. Thanks so much for your support and interest. This internet ministry is entirely supported by public contributions and book sales. 100% of the royalty for all books is contributed to the AIC checking account.